Books by Paul Schullery are like buses; none for a while and then you get two at once. Fresh from reading Shupton’s Fancy, what should drop through the letter box this month, but Real Alaska. According to the dust jacket, Paul’s latest foray asks three questions: what is the essence of wilderness? ; how should wild areas be preserved? ; and how should people be able to enjoy them?. The book was inspired and is based around a week long visit to the Brook river in Alaska’s Katmai National Park and in common with all this author’s writing, it is an absolutely delightful read, with the added bonus of illustrations by his partner, Marsha Karle. I hope that Marsha will contribute drawings to more of Paul’s books in future, because her drawings are delightful (no doubt she will, because some years after this review was first written, she married him and will hopefully now do someting about keeping him in some kind of order). Anyone who has an interest in wilderness ought to read this thought-provoking book. 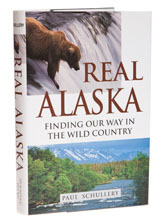 Apart from making a thoughtful introduction to Alaska, the author tackles many subjects which have traditionally been avoided – like how a wilderness can be a wilderness if it is also a tourist attraction and how people and large predators must learn to co-exist if Alaska is to retain its essence? Highly recommended.